Hello. 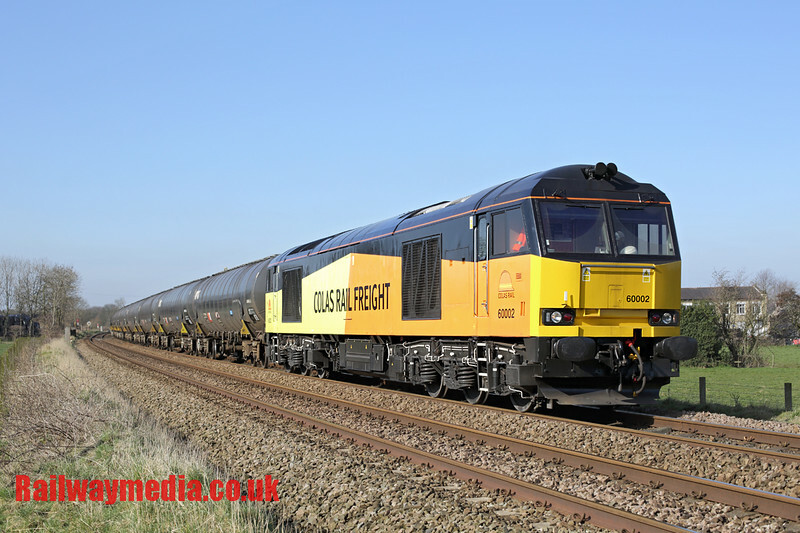 As April is drawing to a close I thought that it was time I wrote another edition of the Railwaymedia blog chronicalling where I have been to with my camera over the last four weeks or so, so as always a warm welcome and I hope a little bit of it might be of use to someone! A rare moment occurred at the end of March as good weather coincided with me being up early enough to leave the house to get a picture of the Preston Docks to Lindsey tank train. This normally thrice weekly working doesn't leave Preston until around 0900 but in order to fight through the school traffic to a location where I can get a decent picture it requires leaving the house not long after 8. This is why since the train began to be worked by Colas Rail Class 60s I hadn't yet managed to get a picture of it: I can't find the motivation to go for it unless there is almost guaranteed sun. Wednesdays traditionally in summer are the day that West Coast Rail run (or used to run) steam specials over the Settle and Carlisle line from Preston. It also seems to be a favoured day for other workings too, so it was that an hour after the log train a Kidderminster to Carlisle working was due hauled by the former LMS locomotive Galatea. I moved from the Gregson Lane location pictured above slightly nearer Bamber Bridge to a foot crossing I hadn't been to previously. Astonishingly considering there was a steam train due I was the only person there. 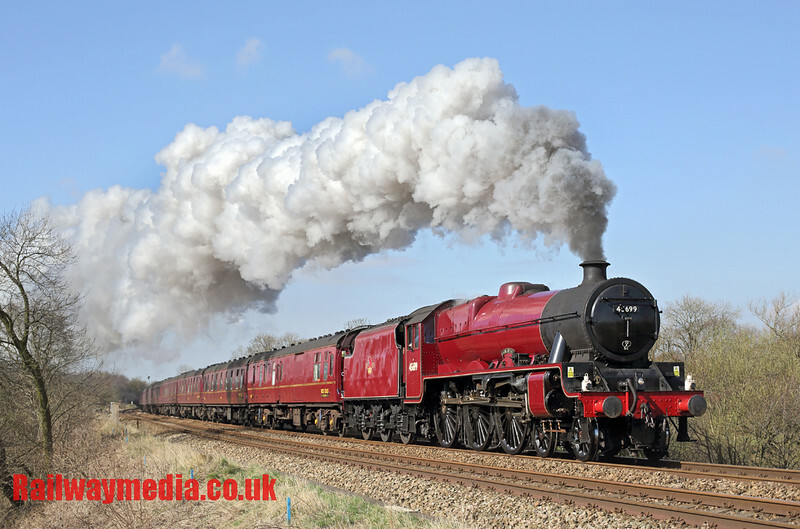 I'll save that picture to the end of the blog in order not to upset anyone as apparently the LMS red livery isn't authentic. Anyway, I had planned staying out all day but by late morning it started clouding over so after a picture of another Colas Rail engine, 56113, heading south down the West Coast Main Line on aviation fuel tanks I adjourned to the pub for the afternoon instead. The beginning of April saw a few short trips out mainly to photograph buses. One particular aim was to get some pictures of Atherton based South Lancs Travel which has recently been bought by Rotala and rebranded Diamond North West. I did though pay a short visit to Winwick Junction. A popular vantage point north of Warrington, for some reason I've never really liked the spot. Maybe I'm getting less fussy with age but I've been twice now this month! The first visit was in pretty poor weather; the only things of note were GBRF's 66701 on an empty coal train and the regular class 67 (pictured above) on Arriva Trains' loco hauled circuit. Details of its duty can be found in blog 65. Into the week after the Easter Bank Holiday and I had two days in the Isle of Man thanks to the fact Citywing have resumed daily flights from Blackpool following the Airport's closure in 2014. With the family there anyway and a return flight going for £46 it was rude not to. As with last year I had a day touring the island myself sampling the excellent local beers before a day with the family. 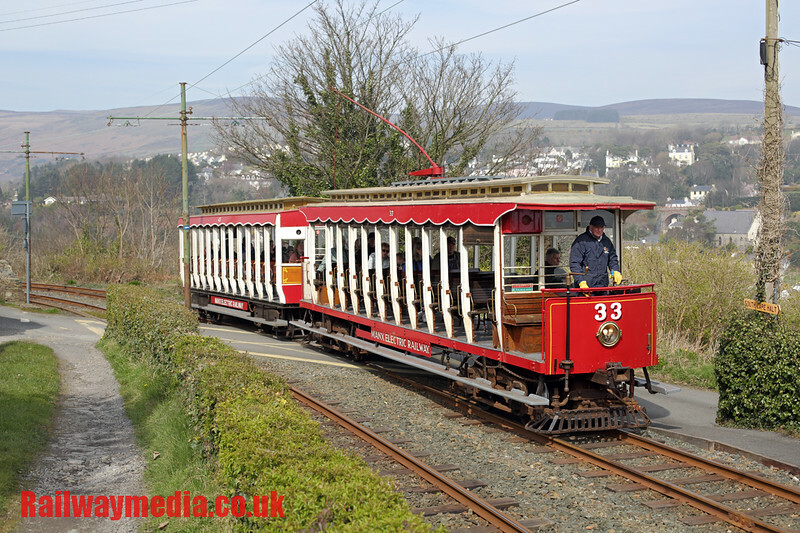 I have been across there a few times now recently so have covered fairly comprehensively the Island's three main railways, so just the odd shot here and there was taken mainly at Laxey of both the Snaefell Mountain Railway and, pictured above, the Douglas to Ramsey Electric Railway. Having only seriously started photographing the local buses last year that was perhaps my main focus. Unfortunately the old red and cream livery, which itself had given way to an attractive maroon and cream based on East Yorkshire's livery has now been superseded on most of the fleet by a very bland all over silver. A lot of the islands double deck buses have also been replaced by single deckers, mainly Mercedes Citaros. They now have a modern but quite boring fleet. 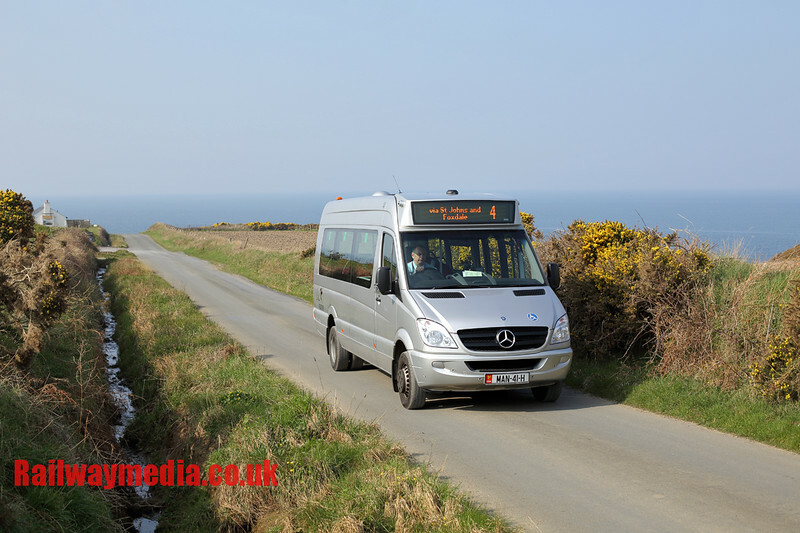 Even worse though are the two Mercedes-Benz minibuses, though to be fair they are only used on the sparsly used 13 to Old Laxey and 4 to Niarbyl. The latter route serves an isolated beauty spot near Peel. By far the nicest picture of the two days, just a shame the subject of wasn't remotely more interesting! I had taken a couple of days off work for the Manx trip but the following week was a booked full week off anyway so I made the most of that by having a few longer trips out too. The weather this month has been pretty decent and with a good forecast for most of the country I headed down to Oxfordshire with the purpose of ending up for the afternoon at Kings Sutton near Banbury. 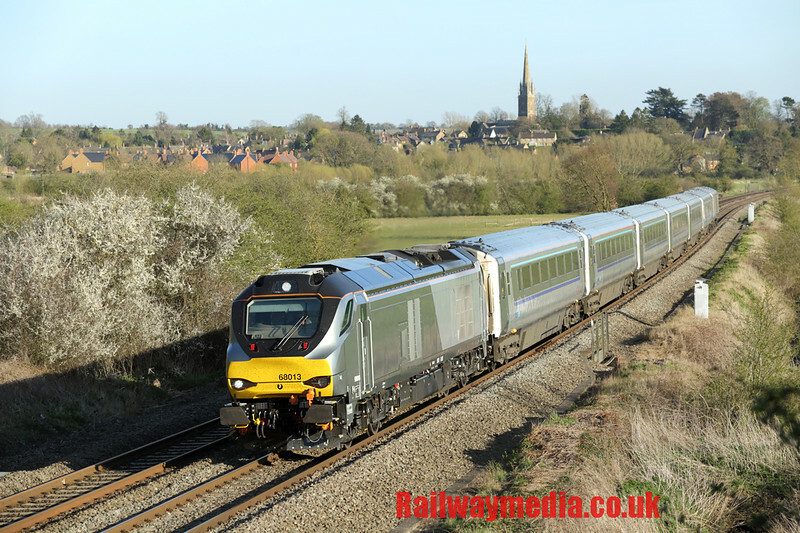 Chiltern Railways have started using class 68s now instead of the class 67s it has been utilising until now on its premium 'Mainline Silver' trains. Apparently they will be using all five of their own branded engines by the end of April but only three of the new engines were out that particular day. The trains they work can easily be identified by the code 'MS' at the top on the Chiltern timetable leaflets with the exception of one peak-hour train to Banbury, the 1750 from London Marylebone. I wasn't sure if this was still loco-hauled so as a result just missed a picture of it. Traffic on this section of the line from Banbury to Aynho is very busy with a good mix of both passenger trains (Chiltern, Cross Country and Great Western) and freight too so a visit is highly recommended. Whilst the Oxfordshire trip was principally for railway photography with just the few bus pictures thrown in, a few days later a trip to Essex was for the entirely opposite reasons. Mainly centered around visiting some Wetherspoons I'd not yet patronised it also offered me chance to see what was happening on the Southend bus scene. 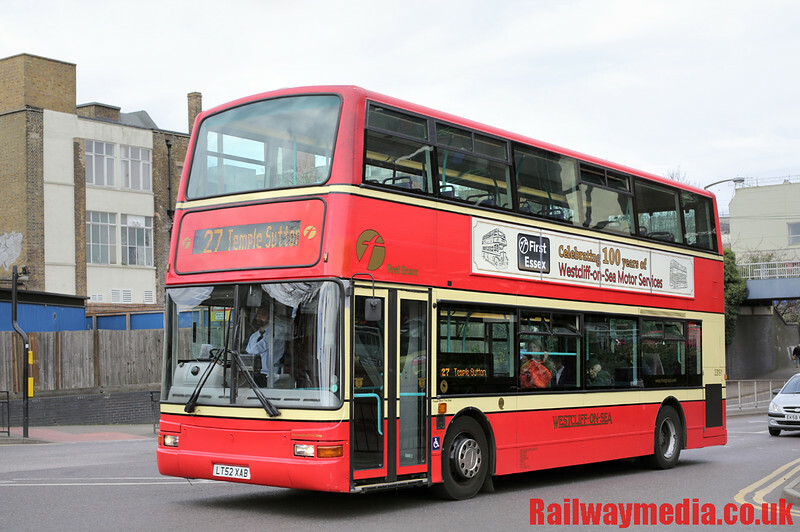 My last visit was in 1992 at the height of a bus war between Southend Transport and Thamesway which saw both operators competeing on most routes with many second-hand vehicles and even former London Routemasters. Needless to say that has all finished although those former operations can still be discerned with Arriva running the former Council routes and First Group operating the former Eastern National (Thamesway) routes and depots. First Bus seem quite keen at the moment in repainting various vehicles in heritage liveries throught the country, this very attractive colour scheme seen in Southend celebrates the former Westcliff on Sea Motor services which became part of Eastern National in 1952. 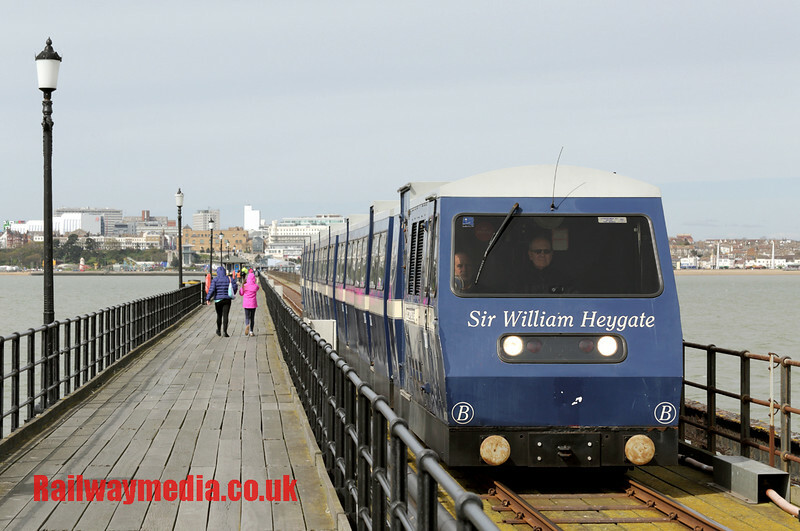 The other main aim of the day was to see and ride upon the Southend Pier Railway. At about 2km long, Southend Pier is the longest in Britain and the railway dates from around 1890, though was shut in the 1970s and got rebuilt in the 1980s. Formerly double track it is now single track with a passing loop half way to enable a two train operation at peak times. There are two identical six-coach trains, each with a diesel loco built by Severn Lamb though only one train was in operation this particular day as it was midweek. There is also a single-car railcar for use at really quiet times. Finally, onto the last 'trip' of this blog, well not so much of a day out but just a few hours back in the Winwick area. With class 319s now having been in use on Northern Rail services for a month or so I had only until now got a picture of one, still in First Capital Connect livery, on training duties. There are currently three diagrams in operation on the Liverpool to Manchester Airport route but all three are only in use at peak hours. 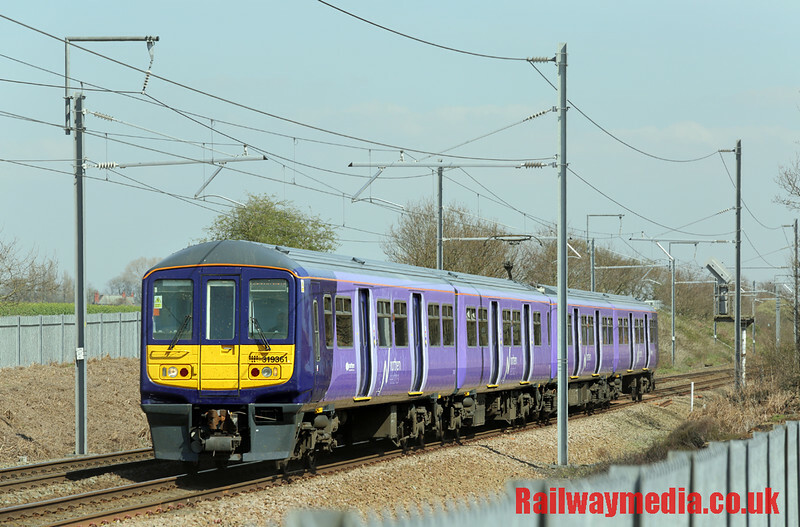 This should change within the next few weeks as Liverpool to Wigan, Warrington and Manchester Victoria services become converted to electric traction. Highfield Common is near Lowton east of Newton-le-Willows. A nice quiet location although step ladders are useful to see over the pallisade fencing! I finally managed to get that picture of a Northern 319 with a shot of 319361 on a Manchester Airport to Liverpool Lime Street service. With the aforementioned visit to Winwick Junction following an hour in Lowton I then ended the day at Red Bank about a mile away from both locations. 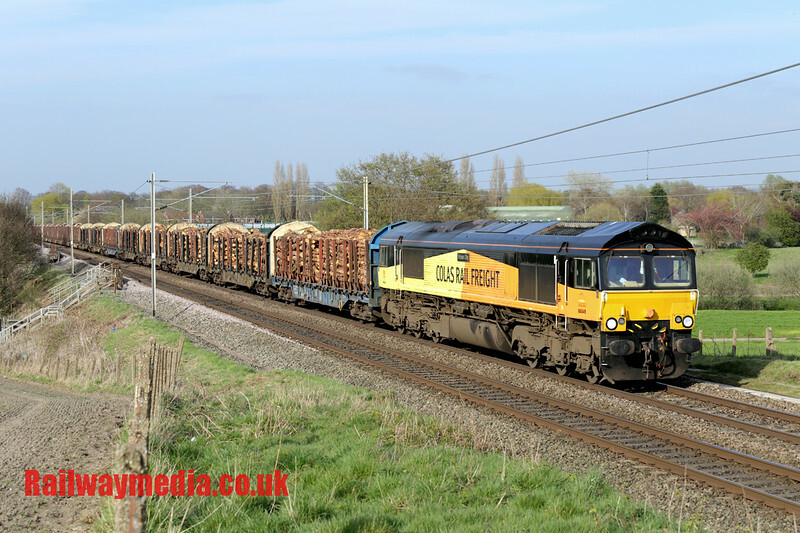 66849 has been the chosen power for Colas' daily log train from Carlisle for months now. Signs are this may change as a class 60 has been trialled, though unfortunately for this shot it was removed from the front each day at Hellifield. That about concludes my wanderings for April so far. The month should end with a visit to the Czech Republic; I'm sure that will feature in the next edition of this blog. Thanks as always for reading, I will leave you as promised with the shot of Galatea near Gregson Lane in Lancashire with 25th March's Kidderminster to Carlisle special. Apparently the London Midland and Scottish colours were never carried by it in service but it looks good despite that. Bye for now.